Three police agencies in St Louis have agreed in response to a federal lawsuit brought by six Ferguson protesters to restrict the use of teargas and other chemical agents on crowds. US District Judge Carol Jackson dismissed the lawsuit Thursday after issuing a temporary restraining order in December. The settlement also calls on her to supervise the case and make sure that both sides comply up to the beginning of 2018. The six protesters who had brought the case agreed to drop their claim and each of the three police agencies involved, St Louis, St Louis County and Missouri Highway Patrol agreed to pay $2,500 in legal cost to each of the plaintiffs. The six protesters had sued over the “unified command” that had handled security at the protests, which were sparked by the unarmed shooting of 18-year-old black Ferguson resident Michael Brown in August 2014. Brown, who was unarmed, was shot dead by white police officer Darren Wilson. Wilson has since been cleared by a grand jury of any wrongdoing. He quit the force in November. 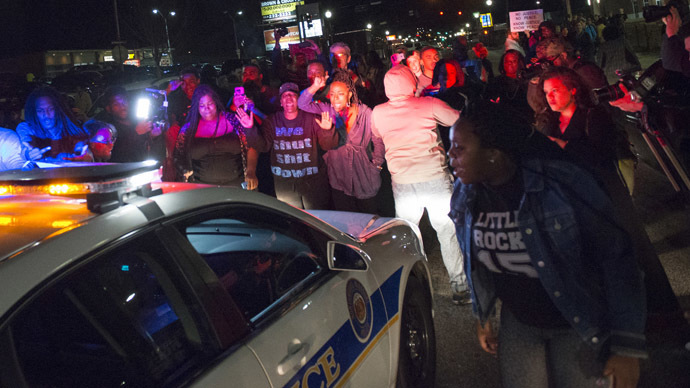 The November 24 announcement that Wilson would not be indicted prompted peaceful protests. Some angry protesters later turned to looting and rioting. Under the terms of the settlement, officers will be required to allow people sufficient time to leave an area before tear gas is used and give “clear and unambiguous warnings” that they are about to use it. Denise Lieberman, from the Advancement Project, who represented the protesters along with Tomas Harvey of the ArchCity Defenders, said that the settlement was an important victory for peaceful protest. “This victory rests on the shoulders of the courageous protesters who are tirelessly demonstrating in the streets of Ferguson, and it’s a testament to the powerful movement they have fostered,” Harvey said in a prepared statement. “We had not seen this kind of excessive police force used against protesters since the Civil Rights Movement of the 1960s. The use of tear gas in Ferguson has been a tactic to chill this movement, and today’s consent decree will finally put a stop to those efforts,” Lieberman said in a joint statement with Harvey. Judge Carol Jackson said during the hearing that she had stopped short of incorporating all of the protesters demands, including that tear gas be restricted for use by police as a “last resort,” which she said was impossible to define. During the December hearing police witnesses said their tactics had been necessary. But according to Brendan Roediger, one of the lead attorneys on the December case, Judge Jackson had decided there was substantial evidence that the police had violated the constitutional rights of these particular protesters. “The best thing the judge said, and she said it a couple of times, was that, ‘It’s clear to me for some reason the police are treating this group, around this movement, differently than they treat other large crowds.’ Hopefully it’ll put an end to the practice of protesters having no idea what the police response will be. No more of this sort of punishment in the streets where what the police are going to do is unpredictable and often violent,” Roediger said.